I find that there is a mix between good and bad financial innovations, although on balance I find more good ones than bad ones. Individually and collectively, these innovations have improved access to credit, made life more convenient, and in some cases probably allowed the economy to grow faster. But some innovations (notably, CDOs and Structured Investment Vehicles, or SIVs) were poorly designed, while others were misused (CDS, adjustable rate mortgages or ARMs, and home equity lines of credit or HELOCs) and contributed to the financial crisis and/or amplified the downturn in the economy when it started. 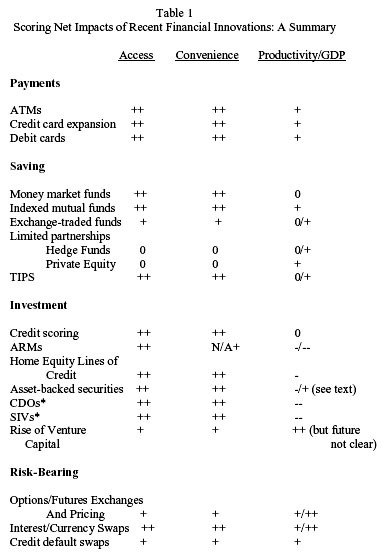 I haven’t read the full paper yet, but in the bloggy tradition of tossing out provocative material to see what other smart people have to say about it, here is Litan’s summary table of what’s good and what’s bad in financial innovation. For now, I’ll just note that aside from the rise of venture capital, which wasn’t a Wall Street phenomenon, there’s not a single innovation in the investment arena that Litan scores as a productivity enhancer. (Securitization gets a positive score, but that’s provisional on it being “restructured by the market and/or policymakers.”) That’s pretty damning coming from a guy who’s obviously pretty sympathetic to innovation. Other comments welcome.